Nicolás Almagro was in deep trouble in his first match at the tournament, down a set and 0-40 in the second set to Gaël Monfils. However, the Spaniard found a way out of that hole and he’s been cruising since. Nicolás hasn’t dropped a set, and he has improved his level of play with every match he’s won so far. I actually think Almagro can go up a notch or two more, to be honest: he’s started both of his last two matches (vs. Lorenzi and Rhyne Williams) rather slowly, perhaps troubled by the fact that he was the overwhelming favorite in both matches. John Isner, as he’s said twice during his press conferences, feels like he’s finally turning a corner. The big man has had a disappointing start to the 2013 season – mainly due to a recurring issue with his knee. However, John is back to finding ways to win tight matches by serving very well, using his transition game wisely, and letting his opponents know that there will be very few opportunities to gain an advantage on him. Isner’s win over red-hot Juan Mónaco yesterday was quite remarkable, given that John got absolutely trashed in the first set, but improved his game dramatically in the second and third sets to get the upset win, along with some revenge for last year’s final loss. – Remarkably, those two encounters have been best-of-five matches. It’s fascinating to think that these two guys, who’ve played nearly 800 tour matches between them (over 500 for Almagro, nearly 300 for Isner) have not met at an ATP sanctioned event before today. – During press yesterday, Isner was full of praise for Almagro’s serve. And with good reason: during their 2011 Wimbledon match John wasn’t able to create a single break point chance. Of course, that wasn’t the case for the Davis Cup match, which sadly doesn’t have stats available. – This will be the third year in a row that these guys meet. 1. Who will be able to find ways to get into their opponent’s service games? Both men have monster serves (they are #1 and #2 in most aces so far this season. Isner trails Almagro by 10 aces entering today’s contest). Almagro has been leading the return categories during this tournament, which I find fascinating. We know that Nicolás is not a great returner of serve, but one thing I will say about him is that he’s getting much better at second serve returns. He also finds ways to deal with big servers, as his H2H with Isner shows, and also his match at the Australian Open vs Jerzy Janowicz. As for Isner, he turned the match around yesterday in large part due to the pressure he started to put on Mónaco’s second serve. He’ll need to do the same today. 2. Who will manage to play the pressure points better? There will be very few opportunities for either man today. Whoever gets a chance at a lead will feel like there’s more hanging on that lone break point than in most matches. 3. Will Almagro be able to keep it together and avoid a costly slow start today? Nicolás has been tight all tournament. But when he’s loosened up, he’s been unstoppable. Finding a way to start this final as relaxed as possible will be key for the Murcia man. The men are out on court, so we should be starting shortly! It’s a pretty hot day in Houston. When the sun is out, it’s pretty brutal. A challenge for both guys. 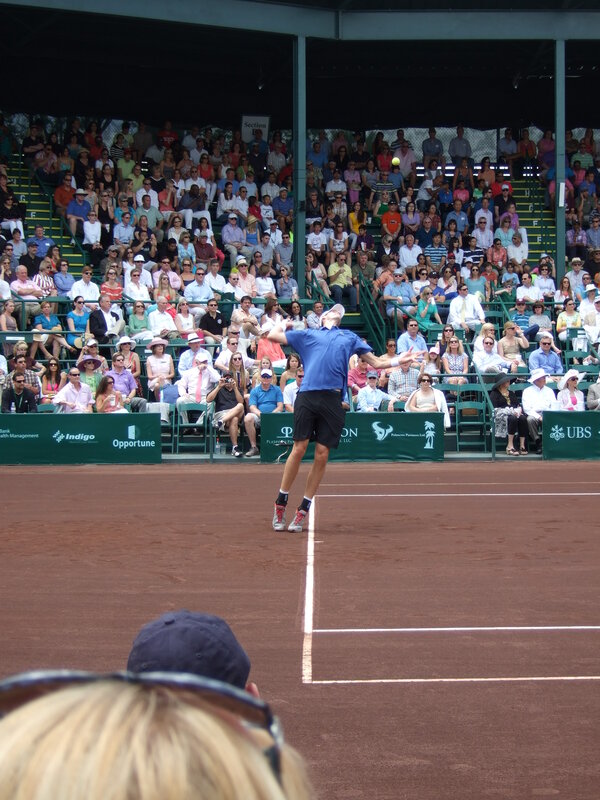 First Set – John Isner will serve first. 0-0: Super quick hold to love. Great serves. 1-0, Isner: Almagro follows suit. 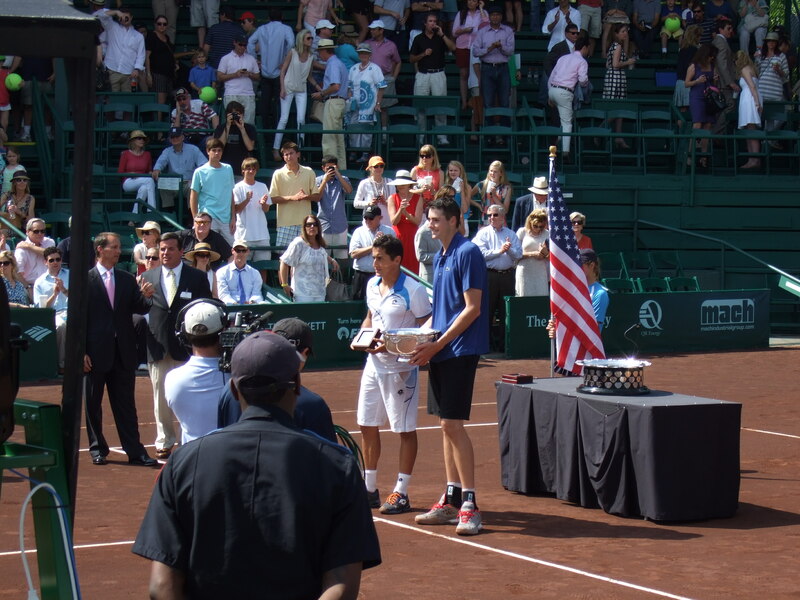 There were a few rallies, but they all ended with Isner errors. 1-1: Almagro gets a few more returns, and Isner botches an overhead and a volley to go down 15-40. Great backhand returns by Almagro so far. First BP is saved with an Ace. The second with a great wide serve. Almagro is standing way back for the returns, and it’s paying off. Isner nets a FH and then double faults the first break away. 2-1, Almagro: Almagro is playing a very composed match so far. Serving well, not forcing the issue with his groundstrokes. And his backhand returns have been great. Isner wins the point of the match to make it 30-all, but Almagro responds with an ace and consolidates the break soon after. 3-1, Almagro: Isner finds two incredible serves at 30-15, and gets a much needed hold. 3-2, Almagro: The top seed gifts the first two points of the game via a BH UFE and a DF. Soon after, Isner plays two great baseline points, anchored by a plethora of good FHs, and breaks back! 3-3: Isner finds himself in a 15-30 hole, but digs himself out with 2 great serves, and a pretty dropper to hold. 4-3, Isner: John Isner is flying. He hits a gorgeous dropper to go up 15-40, and breaks with some huge forehands. He will serve for the set! 5-3, Isner: The big guy is rolling. He serves out the set at love. It’s amazing how quickly Isner overcame the disappointment of handing over that really break. First set to John Isner, 6-3. Second set: Almagro will serve first. 0-0: Almagro stops the bleeding and holds. 1-0, Almagro: A battle takes place in this game, but Nicolás can’t create a break point, despite forcing a couple of deuces. As an aside, I had to leave my court side seat because the sun was way too brutal, and I think my tablet was starting to melt. It’s much nicer in the shade. 1-1: Almagro with another easy hold. 2-1, Almagro: The Spaniard creates a BP after Isner botches a volley and Almagro passes him. John gets a time violation warning, but then hits a beautiful drop volley to stave off the break point. Another great volley seals the hold moments later. 2-2: Yet another easy service game for Almagro. Almagro is at the baseline well before Steiner calls for the players to start the game. Impatient, much? 3-2, Almagro: Isner holds at love, which is a welcome development for him. 3-3: Isner gets a 0-30 lead after some sloppy play from Almagro, but he can’t put 3 straight serves in play, and Almagro ends up holding. 4-3, Almagro: Isner seemed on his way to another love hold, but netted a FH. No matter: a service winner clinches the hold moments later. Isner is playing very well. Simply put, Almagro will have to come up with something special to turn this match around. Isner’s FH is humming. 4-4: After a DF, Almagro is once again behind on a service game of his. And after Isner forces an error with a great FH approach, the big guy has a BP on a second serve, no less. However, John can’t put the kicker to his backhand back in play. At deuce, Almagro hits a gorgeous BH DTL on the run, and soon after, he holds. Those two points at the end of that game are the kind of special tennis that Almagro will need to produce if he wants to force a third set. Almagro will also need to go DTL with his BH during rallies more, because Isner is being able to hide his own BH really well by running around it. 5-4, Almagro: Almagro let’s out his first frustrated scream after he can’t get a defensive slice over the net at deuce. Isner then fires an ace to hold. 5-5: Almagro DFs, and then sends a BH long to fall behind 0-40. However, great serving saves all 3 BPs…until another DF gives Isner BP again. It is saved with a gorgeous BH pass that Isner can’t handle. A framed FH gives Isner his 5th BP of the game, and this time Almagro sends a BH long, unprovoked. John Isner will serve for the championship! After getting broken, Almagro blasted a ball out of the stadium in frustration. Got a warning. 6-5, Isner: Isner falls behind 0-30, but a good volley and two bombs bring him to match point. 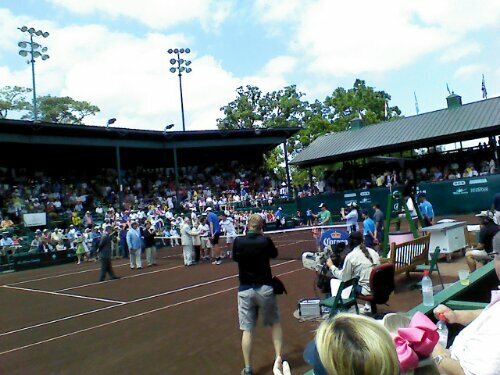 Another bomb comes to the rescue, and John Isner has won the 2013 Men’s Clay Court Championship! Absolutely fantastic win for John. He’s right – he’s definitely turned a corner. – Nicolás was asked whether he was satisfied with the way he played, and he couldn’t come up with an answer. He says it’s too soon after the match to think about what went wrong, and that he’ll surely have time to think about all these things during his long flight to Europe. – Almagro did not seem overly optimistic about the upcoming European season, saying that last year he was playing better than he is right now, and that it just means he’ll have to work a lot in the coming days and weeks. – Nicolás will be taking some sleeping pills for his flight, so whatever analysis he does of this match will surely happen in his dreams. – Almagro said that he doesn’t know whether he’ll be back next year, but he did say he’s had a great time in Houston, and that he liked the city a lot. He said he’s had a chance to do other stuff that he can’t normally do during other tournaments (let’s remember that he was here as early as the Friday before play started and that his first singles match was almost a week after that). – Isner apologized for not being able to sit down, said that he was cramping in the locker room, “like Rafa.” This is very understandable, even though the final was so short: the conditions out there were pretty brutal. The sun was unforgiving, and it was quite humid. 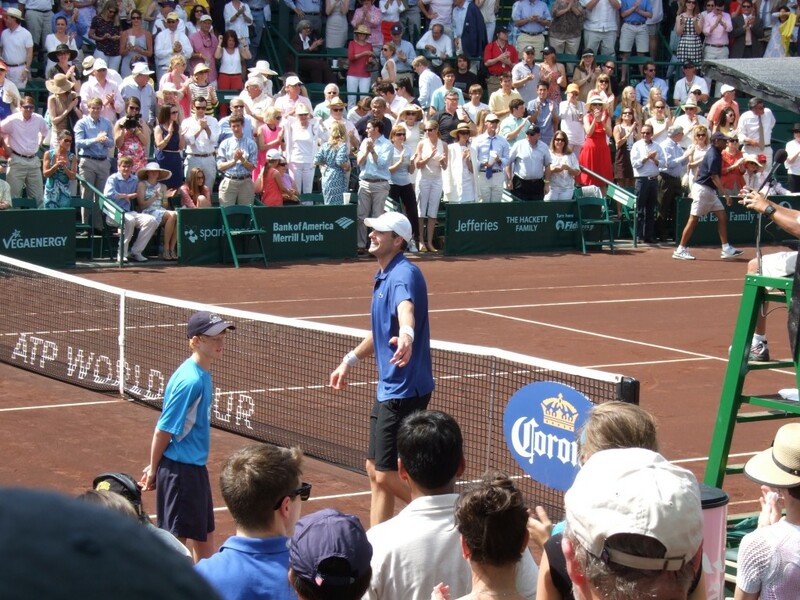 – Isner was jokingly asked if he was the new “King of Clay.” He laughed it off, naturally. – John knew it was going to be a tough turnaround after playing Davis Cup in Boise, but he also knew that the hardest part was getting over that first round match (John didn’t get a bye). Once he got over Harrison, he started to improve and feel better and better on the surface. – Isner wasn’t surprised by Almagro’s strategy of standing way back to return his second serve. John said that even though he missed some forehands, he was happy at how that shot was working. He said that the clay was making the ball land right on his strike zone, which helped his cause. – Isner wasn’t happy with the 2 o’clock sun – he blamed it for that early service game in which he got broken (Almagro also struggled to serve from that end of the court – the sun had to be a huge issue for both righties). Isner jokingly said that he needs to start a petition to have the final start at “3 or something”. – Isner was really happy with his 5 game winning streak in the first set (he was down 1-3 and won the set 6-3). John was particularly happy with how he played the 4-3 game on Almagro’s serve. I completely agree. Almagro might have been sloppy to give back the early break, but I’m not sure there’s anything the Spaniard could’ve done differently in that 4-3 game. Isner was just phenomenal. – John said something interesting about the conditions this event presents to his game: he said that the courts are slow, which he likes, and the balls are light (they use the Wilson US Open balls). He said that these two elements make for a good recipe for his success. – John truly believes he can beat anyone on clay (he does have a clay win over Federer, pushed Djokovic to a five setter on clay in Belgrade and remains the only man to take Nadal to a fifth set at the French Open). And he has every right to believe that – I’m not sure anybody wants to play the big guy right now. He’s a handful, and he’s full of confidence. My first impression of Nicolás Almagro as I saw him practice on the Friday before the tournament started was that he was not relaxed. At all. He seemed tense and frustrated: the image of a man who is carrying a huge, invisible burden on his shoulders. My wife, who saw him play yesterday, as well as a practice set last Sunday, thought that Isner would take this match, because Almagro hadn’t found a way to loosen up throughout the week. She was right, in the end. I remember thinking at the beginning of the week that Almagro should be the man holding the trophy at the end of the tournament. The quality of his baseline strokes are just a notch above everyone else I saw this week. However, as we know full well, there’s more to winning tennis matches than just hitting awesome baseline shots. 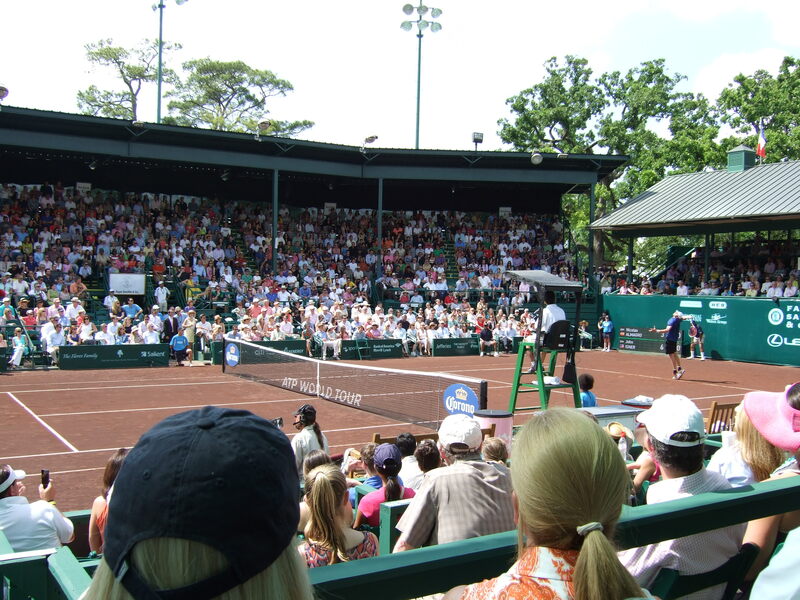 I remember watching John Isner practice for the first time at this event. It was on Monday on an outer court. I even took a picture of it. He seemed pretty relaxed, and he was just trying to hit good serves. I missed Isner’s first two matches, but I did catch his win over Berankis and his huge semifinal victory over defending champion Juan Mónaco. In both of those press conferences, John said more or less the same thing: he felt like he was playing well, and that he was turning a corner. And even though J0hn had made that breakthrough internally, I do think it truly materialized in the second set of the semifinal. Isner started to play the kind of tennis that saw him reach the top 10: he was serving beautifully, making great volleys, and doing a lot of harm with his forehand. His second serve returns got a lot better, too: all of a sudden the rallies weren’t easy opportunities for his opponents to win points. I was also impressed with how well Isner recovered after the mental blow of double-faulting away a break so early in a final. It seemed ominous, but it wasn’t. Like he said, the string of games he played from 1-3 down was simply phenomenal. Only good things will happen to John if he keeps playing this way. Because he definitely turned a corner a the River Oaks Country Club.